Property 1: A SQ-universal group contain a non-abelian free group (of countable rank). Proof. Let be a SQ-universal group. In particular, there exists a quotient containing a free group of infinite rank . Let be a lift of in . If there existed a non-trivial relation between the ‘s then the same relation would hold between the ‘s in . Therefore, is a free subgroup of infinite rank in . Property 2: A countable SQ-universal group contains uncountably many normal subgroups. Proof. Let be a countable SQ-universal group. Every quotient of contains only countably many two-generated subgroups. However, we know that there exist uncountably many two-generated groups up to isomorphism: see for instance the notes Amalgamated products and HNN extensions (I): A theorem of B.H. Neumann or Cantor-Bendixson rank in group theory: A theorem of B.H. Neumann. Therefore, must have uncountably many quotients, and a fortiori uncountably many normal subgroups. Although SQ-universality seems to be a very strong property, many groups turn out to be SQ-universal. We already saw in previous notes that the free group of rank two is SQ-universal; in fact, we gave two proofs, the one in Amalgamated products and HNN extensions (I): A theorem of B.H. Neumann, and the other, completely elementary, in A free group contains a free group of any rank. Other examples come from the following trivial observation: a group with a SQ-universal quotient is itself SQ-universal. Therefore, any group with a non-abelian free quotient is SQ-universal; in particular, we deduce that any non-abelian free group, of any rank, is SQ-universal. Together with the following result, we will be able to exhib a lot of other examples of SQ-universal groups. Theorem 3: A group containing a SQ-universal subgroup of finite-index is itself SQ-universal. For an (almost) elementary proof, see P. Neumann’s article, The SQ-universality of some finitely presented groups, J. Aust. Math. Soc. 16, 1 (1973) . Example 1: Let be a closed surface. Then either is SQ-universal or is a sphere , a projective plane , a torus or a Klein bottle . Notice that we already dealt with surface groups in the previous note On subgroups of surface groups. In particular, we know that , , are not SQ-universal. We also know that contains as a subgroup of finite-index two, so it cannot be SQ-universel. we deduce that is SQ-universal. Example 2: A right-angled Artin groups is either free abelian or SQ-universal. 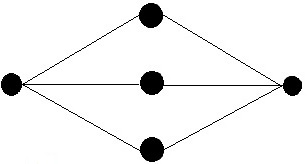 where and denote respectively the set of vertices and edges of . 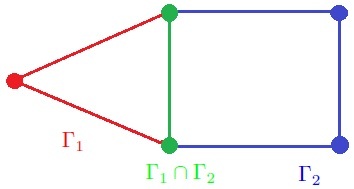 In particular, if is a complete graph with vertices, then is the free abelian group ; if is a graph with vertices and no edges, then is the free group . We claim that, if is not a complete graph, then has a non-abelian free quotient, and in particular is a SQ-universal group. Quotienting by the subgroup , we get the free group . Example 3: If and are two finite groups with and , then the free product is a SQ-universal group. is a free basis of the derived subgroup of . Furthermore, the quotient is finite, so that is a non-abelian free subgroup of finite index in . From Theorem 3, we deduce that is SQ-universal.